A thorough neurological evaluation including mental status, shunt appearance and continuity, funduscopic examination for papilledema, cranial nerve function, sensorimotor examination, gait, balance, and coordination is essential. The patient can have a pseudomeningocele around the shunt with malfunction and papilledema with raised ICP (shunt failure, normal volume hydrocephalus, pseudotumor cases). Shunt and CSF analysis by shunt tap: A shunt tap may be of little yield in a slit ventricle presentation. Other lab tests are usually normal. Shunt series: Standard imaging of the shunt with a series of x-rays can reveal a source for a shunt’s malfunction. Uses to rule out shunt failure: CT scans of the brain and shunt x-rays are usually the modalities first used to rule out shunt malfunction. CT scans are better than MRIs for visualizing the shunt catheter location in the brain. 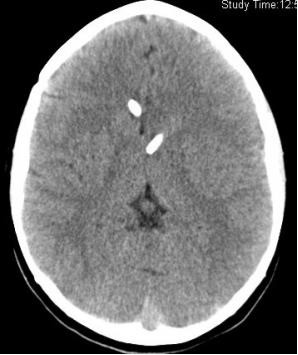 CT scan: This image shows slit ventricles in a patient with severe headaches. T1-weighted images: An MRI of the brain can offer a more detailed examination of brain and ventricular anatomy and spare the child radiation (5). 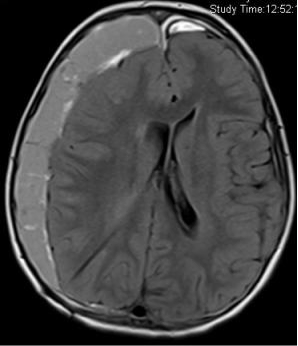 Scans will show small or slit ventricles, a paucity of subarachnoid space in elevated ICP situations (tight brain), and possible Chiari malformation with tonsillar herniation. T2-weighted images: There are other signs on MRI T2-weighted sequences indicative of elevated ICP, i.e., fluid around the optic nerve, an empty sella, or protrusion of the optic disc into the globe (20). T1-weighted MRI: This image shows shunt overdrainage with resulting subdural formation. MR venograms: This study can rule out abnormal venous anatomy. Shunt patency study: A radionuclide shunt study is useful to assess patency. It can assess flow through the shunt system and integrity of the catheter. Not used for acute evaluation: Although this evaluation may be of use in evaluating the impact of chronic headaches in a shunted patient, it is not generally used for establishing an acute treatment plan. History, examinations, and imaging: A management plan is created on the basis of the overall clinical picture, as it correlates to the imaging, with emphasis on the symptoms and signs and their severity. Some children can then be managed with cautious outpatient observation with close follow-up. Many will need to be admitted for IV fluids, medications, and possibly ICP monitoring or surgery.